List events, such as the adding or deleting of a list on a website. List item events, such as the editing of an item in a list. Add-in events, such as the installation of an add-in. SharePoint-hosted SharePoint Add-ins do not support event handling, but you can turn a workflow into a kind of list or list item event handler by setting an event to trigger the workflow. For more information, see Workflows in SharePoint. Workflows cannot be triggered by add-in events, so add-in events cannot be handled with a SharePoint-hosted add-in. Website events and site collection events are not supported in SharePoint Add-ins. Before events are triggered before the SharePoint infrastructure does any of its own handling of the event (including committing changes to the content database). In SharePoint custom before event handlers always execute synchronously. Among other purposes, they can be used to cancel the event. For example, if an add-in has a function for deleting a list, a handler for the list deleting event can cancel the deletion if certain conditions are not met. If the event is part of a sequence of events, cancelling it prevents any of the later events from occurring at all. For example, if your handler for the ItemAdding event cancels the event, the ItemAdded event, which normally comes later, is not triggered. After events are triggered after the SharePoint infrastructure does any of its own handling of the event. In SharePoint, remote after event handlers, for list and list item events, always execute asynchronously. (App events are an exception.) Among other purposes, they can be used to log events. Events in the host web are registered programmatically with the CSOM (client-side object model) or the SharePoint REST API. This task is typically done in "first run" logic in the add-in or in a handler for an add-in event. (For an overview of add-in events, see Handle add-in events later in this article.) For a code sample that programmatically registers a list event, see SharePoint/PnP/Samples/Core.EventReceivers. Events in the add-in web are usually registered in a feature of the add-in web with some simple XML markup. Details of how to create the markup and the service are in Create a remote event receiver in SharePoint Add-ins. It is also possible to register add-in web events programmatically. RERs have the same purpose as event receivers in farm solutions, but event receivers have custom code that runs on the SharePoint servers, so they cannot be used in SharePoint Add-ins. Your add-in can handle the following list and document library events. Events ending in "ing" are before (synchronous) events and those ending in "ed" are after (asynchronous) events. The field update events are about changing the properties of a field (column) on a list, such as whether it is sortable, not about changing the data in the field. Your add-in can handle the following list item events. *These two new events may not be available in the Visual Studio UI. If not, pick ItemDeleting or ItemDeleted, and then manually change the names. A web service file, such as RemoteEventReceiver1.svc, is added to the web application to handle the events that you specified when you added the remote event receiver to the SharePoint Add-in. The web service contains a code file to handle the remote events. ProcessEvent() handles "before" events (such as those in the left-hand columns in the tables earlier in the article) and it returns an object to SharePoint that reports on whether it should cancel the event or let it proceed. ProcessOneWayEvent() handles "after" events. It runs asynchronously and does not return anything to SharePoint. When a registered event occurs, SharePoint calls the appropriate method in your service and passes an object that provides some context information for your code. For example, the event type (from one of the two tables earlier in this article) is identified, so that your code can branch to the logic that is appropriate for the event. A project item for the remote event receiver is added to the SharePoint Add-in project. 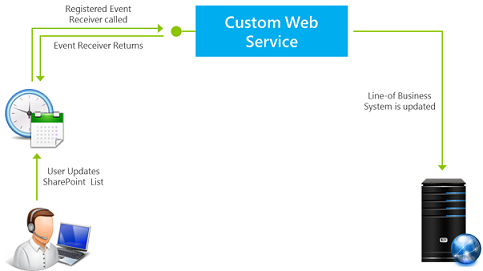 The Elements.xml file for the remote event receiver references the web service in the web application and the remote events that you specified. The following example shows an Elements.xml file that handles the addition or deletion of a list item. To change the events that the remote event receiver handles, open Solution Explorer, open the Properties window for the remote event receiver, expand the SharePoint Events node, and then set only the events that you want to handle to True. For additional information about RERs, including some troubleshooting information, see Remote event receivers FAQ. Add-in events are also handled by remote web services, but they are configured differently in the add-in package from list and list item RERs, so they are treated as a separate category of component. For an add-in event, the remote web service is registered in the add-in manifest, not in an add-in web feature. The add-in doesn't even have to have an add-in web. There are three add-in events as described in the next sections. The AppInstalled event runs immediately after SharePoint has finished everything that it needs to do when the add-in is installed, but before the user is notified that installation is complete. Although this is an after event, SharePoint runs your handler synchronously. The add-in is not available for use until after your handler has completed, and your handler can cancel the installation (which causes SharePoint to roll back everything it has done as part of the installation). In fact, it is a best practice to catch any errors in your handler and instruct SharePoint to roll back the installation. For more information, see Include rollback logic and "already done" logic in your add-in event handlers. When you install an add-in with Tenant scope, it is installed to the add-in catalog site collection, and the AppInstalled event runs then and only then. The add-in is visible in multiple websites in the tenancy, but the event does not run separately for each of these. Installing SharePoint components to the host web that cannot be declaratively installed with the host web feature, such as lists or subwebs. Programmatically registering list and list item event handlers with the host web or add-in web. Setting app-instance-relative initialization settings. For example, your add-in can have an add-in web property bag for holding settings that vary from one instance of the add-in to another. Your AppInstalled handler can write varying values to the property bag, based on, say, the site type of the host web (such as Team Site or Blog site). Checking to see if the host web is an AppCatalog site is a good way to detect whether the add-in has been installed with tenant scope. See Tenancies and deployment scopes for SharePoint Add-ins. Performing app-instance-relative configuration in the add-in's remote web application, such as adding a table to a database. Your implementation of the AppInstalled event must complete within 30 seconds or the SharePoint installation infrastructure thinks it has failed. The infrastructure reruns the event and repeats your code from the beginning, up to three additional times. After four timeouts, SharePoint rolls back the entire add-in installation. The full implications of these facts are discussed in Include rollback logic and "already done" logic in your add-in event handlers. The AppUninstalling event does not run when the add-in is removed from the host web. Removal of an add-in only moves the add-in to the user's recycle bin. Two more steps are required before the AppUninstalling event is triggered. First, a user must remove the add-in from the recycle bin, which moves it to the second stage recycle bin. Second, a user must remove the add-in from the second stage recycle bin. This last task triggers the AppUninstalling event. The AppUninstalling event is synchronous and you can use it to cancel the uninstallation, which would leave the add-in in the second stage recycle bin. The main purpose of a handler for this event is to delete or recycle things that were deployed with an AppInstalled (or an AppUpdated) handler. SharePoint cannot delete these things, or move them to the recycle bin, because it doesn't know about them, at least not as components of the add-in. It is usually a good practice to remove these things. But you don't want to delete things that still have a useful life after the add-in is gone: if a list or website created by your AppInstalled handler is still going to be used, don't delete it in your AppUninstalling handler. The AppUpgraded event runs immediately after SharePoint has finished everything that it needs to do when the add-in is updated to a new version, but before the user is notified that updating is complete. Like the AppInstalled event, it is an after event, but is essentially synchronous, and it is a best practice to catch errors and notify SharePoint to roll back the update. Add, change, or remove add-in components from the host web. Do things in the add-in web that aren't possible with the declarative update semantics in an add-in web feature. For example, you cannot delete anything with the declarative update markup, but you can do so programmatically in an AppUpgraded handler. Make changes to app-instance-relative components in the add-in's web application or remote database. For detailed instructions about creating add-in event handlers, see Create an add-in event receiver in SharePoint Add-ins. Tell SharePoint that an error has occurred. The SOAP message that your add-in event handling web service returns to SharePoint has a Status property that can have the values of Continue, CancelWithError, or CancelWithoutError. Either Cancel status tells SharePoint to roll back the event. Roll back what the handler has already done before the handler encounters the error. SharePoint can't usually do this for you because it doesn't know what your handler did. This isn't a universal rule. For example, if an add-in installation is canceled, SharePoint deletes the entire add-in web, so there's no point in an AppInstalled event handler reverting anything it has done to the add-in web. But it usually should roll back things it did to the host web or to remote components of the add-in. The preceding points apply to the AppUninstalling event as much as to the other two add-in events. For example, if your handler for the uninstalling event deletes a row in a remote database, and then encounters an error, the row needs to be restored. Because your service sends a cancel message to SharePoint, the add-in is not removed from the recycle bin. If it is restored from there and used again, it may fail to work without that database entry. However, your AppUninstalling handler completes before SharePoint removes the add-in from the recycle bin. So, if SharePoint itself encounters an error and needs to cancel the removal, there is no way for your handler to undo what it has done. If SharePoint doesn't receive a results message from your handler in 30 seconds, it calls the handler again. It gives up entirely and rolls back the event after three retries (four tries in all). Each time it calls the handler, your code starts again from the beginning. But you generally don't want your handler to redo things it has already done, such as create a list on the host web, and you can't know if your rollback logic was completed, or even triggered, before the handler timed out. For this reason, your handler logic should not take any action without first checking whether the action has already been done, unless it would be harmless to do it again. Installation and updating errors can be seen in the SharePoint UI, as shown in the following figure. Send cancel message to SharePoint. However, implementing your rollback and "already done" logic in your web service can slow down the handler. Both your installation and rollback logic usually make changes to something more or less remote from the web service, such as the SharePoint host web or a back-end database. If your installation and rollback code is split between the Try and Catch sections, the service is making separate calls to the remote components, often several such calls in each section. Call the "Do X" procedure on remote platform. If remote platform reports failure, call Catch. The "Do X" procedure that executes on the remote system would itself contain the rollback and "already done" logic like the following. Set success flag to true. Set success flag to false. Return success flag to the event handler. For example, if your handler needs to take action on a SQL Server database, you can install a stored procedure on the SQL Server that uses a TRY-CATCH block to implement installation-rollback logic with IF-ELSE blocks to implement "already done" logic. The SharePoint Add-in model doesn't provide a way to store custom server-side code on SharePoint and invoke it from the CSOM (client-side object model). But the CSOM does provide a way to bundle try-catch and if-then-else logic and send it to the server for execution. For a detailed example of a add-in event handler that uses the handler delegation strategy to add a list to a host web, see Create an add-in event receiver in SharePoint Add-ins. For a code sample, see SharePoint/PnP/Samples/Core.AppEvents.HandlerDelegation. You cannot always use the handler delegation strategy. For example, when your handler is calling out to more than one component, such as to a database and the SharePoint host web, there is a chance that one could complete successfully and the other fail. In this scenario, the rollback logic for the first component doesn't run if you designed it with the handler delegation strategy. For this reason, if you are calling to the components synchronously, only the last one called can use the handler delegation strategy. If they are called asynchronously, you can't use that strategy in any of them. For a sample of an add-in event handler that does not use the handler delegation strategy, see SharePoint/PnP/Samples/Core.AppEvents. If the AppInstalled event fails, SharePoint deletes the add-in web if there is one; and if the AppUpated event fails, SharePoint restores the add-in web to its pre-update state. For this reason, your handlers never need to roll back actions they take on the add-in web. If your handler performs actions on both the host web and the add-in web, it should deal with the add-in web first. Doing so makes it safe to use the handler delegation strategy for the host web. Even if the add-in web actions succeed and the host web actions fail, no rollback logic goes unexecuted. Some restrictions on how you design an add-in support multiple security zones and have a remote event receiver. For more information, see Knowledge Base article kb3135876 You can't add a provider-hosted add-in to a SharePoint 2013 site in non-default zones. The following are common questions you may have when using remote event receivers. How are remote event receivers different from event receivers in SharePoint 2010? In SharePoint 2010, event receivers handle events that occur on SharePoint lists, sites, and other SharePoint objects by running the code on the SharePoint server (either full-trust or in a sandbox). This type of event receiver still exists in SharePoint. However, SharePoint also supports remote event receivers in which the code that runs when the event is triggered is hosted by a web service. This means that if you register a remote event receiver, you also need to tell SharePoint which web service to invoke. In the following code samples, the first example (SharePoint solutions) implements functionality by using an event handler. The second example (SharePoint Add-ins) implements the same functionality by using a remote event receiver. // Trigger an event when an item is added to the SharePoint list. /// When an item updates, run the following. // Add code that runs when an item is added or updated. For the complete code sample, see Add list item properties with a remote event receiver. For a detailed demo of the code sample, see Migrating a SharePoint event receiver to a remote event receiver. How do remote event receivers work? The user performs an action on SharePoint (for example, edits a list item). SharePoint then talks to the registered web service. You could perform some operations (for example, update a list item property, or update a backend system). The web service can also talk to the Access Control Service (ACS) to request its own signed token to do a call back to SharePoint. Using this token, you can perform remote actions from within the web service as a result of the earlier operation on the list item or in the backend system. How do I debug remote event receivers? See Debug and troubleshoot a remote event receiver in a SharePoint Add-in. Are there any restrictions on where a remote event receiver can be hosted on its URL? Will a SharePoint 2010 event handler work on SharePoint after I upgrade? If a SharePoint 2010 solution package containing an event handler is upgraded to SharePoint, depending on your customizations, the solution package may work without any modifications. This includes the event handler too. If the SharePoint 2010 solution is remodeled into a SharePoint Add-in in SharePoint, the event handler should be rewritten as a remote event receiver. See Migrating a SharePoint event receiver to a remote event receiver.